Paced Breathing is an Android app which helps you improve your breathing by giving you visual, audio, and haptic (vibrate) breathing cues. This is very useful not only for yoga and meditation, but also for exercise training, like running. Just pick a comfortable starting point and start improving your breathing! 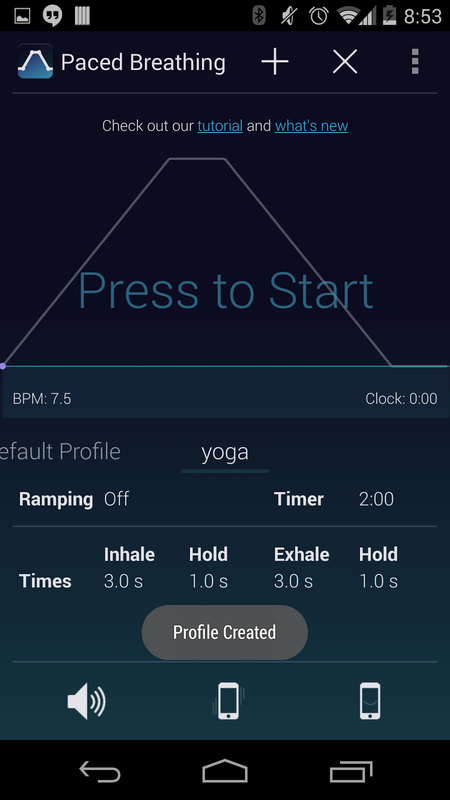 A utility to let you improve your breathing technique. 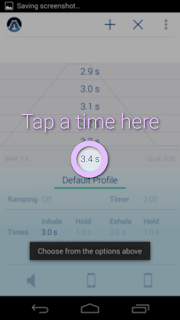 You simply set your inhale, exhale, and hold times to whatever you want, and this app will give you ques of when to start inhaling and exhaling. The key to breathing is to not force yourself, you should never be straining yourself during your sessions- the point is to relax. If you find it hard to complete a session, please please please stop the session and readjust your times. Also, if you have any health issues, especially lung related issues, make sure to check with your doctor and to pay especially close attention to what your body is telling you. Just click on "Press to Start" to begin a session. You'll hear a sound right away, just follow the instructions on the screen. How do I stop the session? The times are too fast (or slow)! No worries, simply click on the top half of the screen (on the graph) to stop the current session. Now press on one of the inhale, exhale, or hold times. You'll see a menu pop up over the graph. You can scroll through this menu and pick the right time for you. Adjust all your times to what you feel is comfortable and start again. How can I improve my breathing with this? You can either use the app daily and adjust your times as your pace improves or you can use the ramp feature. 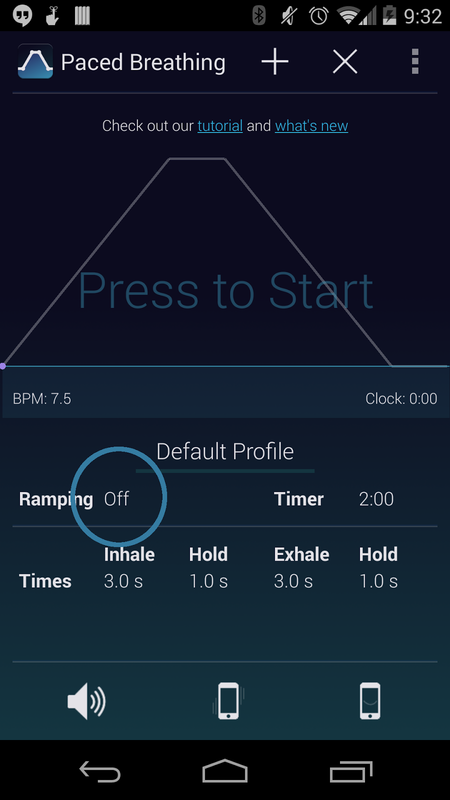 With ramp Paced Breathing will change your breathing times during a session for you. For example, you can start with a regular breathing rate, and over the course of 10 minutes progress to a very slow relaxing pace. Check this page out for an in-depth look at ramping, or just click on "Off" to the right of "Ramp" to turn it on. Just click on "Off" to the right of "Timer" and select 10:00. Your session will stop automatically 10 minutes after you start it. I don't like the sound! You can click on the sound icon in the lower left hand corner and change the sound. There are a few different options. I don't want sound, but I still want feedback! We have haptic (vibrate) feedback too. Just turn off the sound from the sound menu and click the vibrate icon (the icon to the right of the sound icon). Yes, you can open other apps and your session will continue. To get back, just click on our notification. The screen keeps turning off! I want to switch between different sets of breathing times! Just click on the + icon in the upper right hand corner (if you see no + icon, go to your menu and click on "Create Profile"). Enter a name for your new profile and click create. You'll see your new profile now, just set your new times and go! No need to worry about saving, everything autosaves! To switch profiles, just swipe left or right. 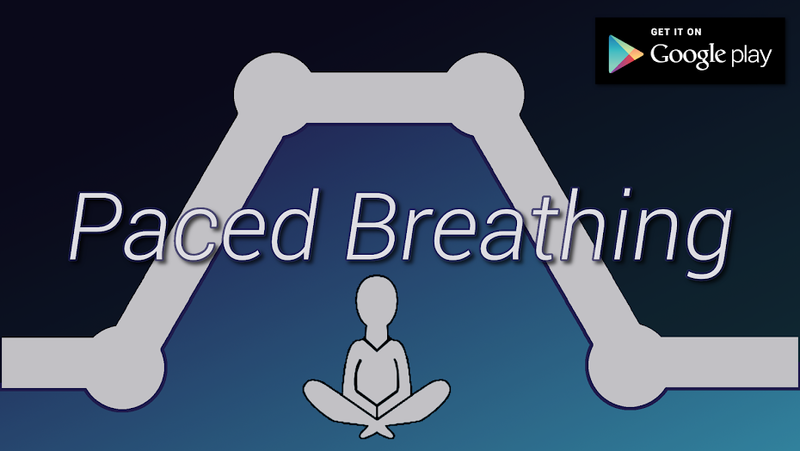 If you get a new phone and install Paced Breathing on it, your profiles will even be restored! If you are having issues, check out this page for more details on profiles. Below the graph, to the left you'll see BPM which shows you how many breathes per minute you're taking with the current pace. To the right you'll see Clock, which shows you how long your current session has been going on for. We are working to add session logging so you can see your history as you've progressed, so stay tuned! Can you suggest some good settings to get the most out of the app? This is actually pretty tricky to do because peoples' breathing is so different and so are their goals. Here are the times we've personally used to help us get going every morning. Even with a relatively short 5-10 minute session you should notice you're more relaxed throughout the day, and in general have a more positive outlook on your day! Remember, the key is to not force yourself, you should never be straining yourself during your sessions- the point is to relax. If you find it hard to complete this or any other session, please please please stop the session and readjust your times. We'd love to hear from you! Comment on this post or post on our group page! We'd love to share your positive experience with others. 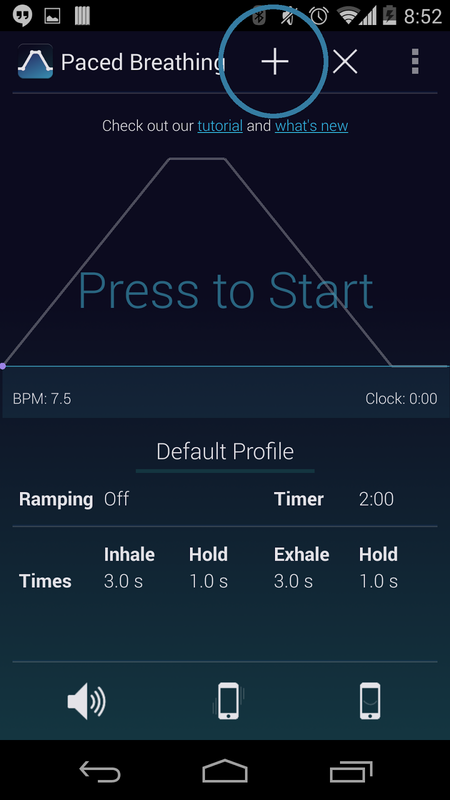 What's new in Paced Breathing 2.0? 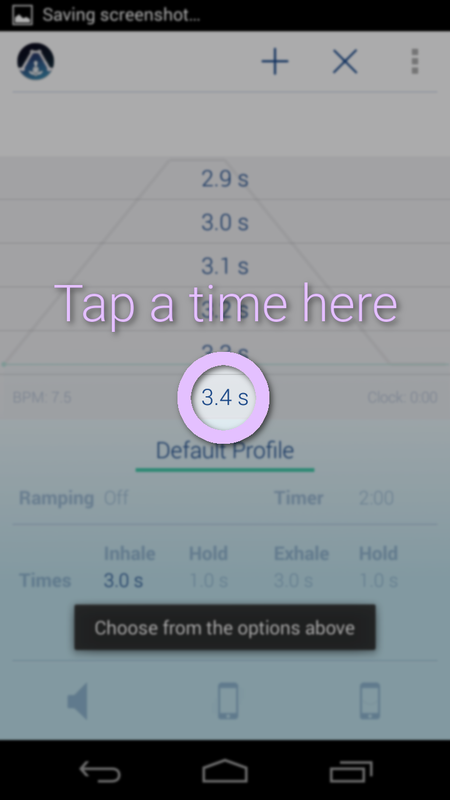 If you are permission conscious or want the smallest app possible, you can instead switch to the Paced Breathing Pro app. This version will never have ads, never require additional permissions, never get bloated, and will always have all of our features*. 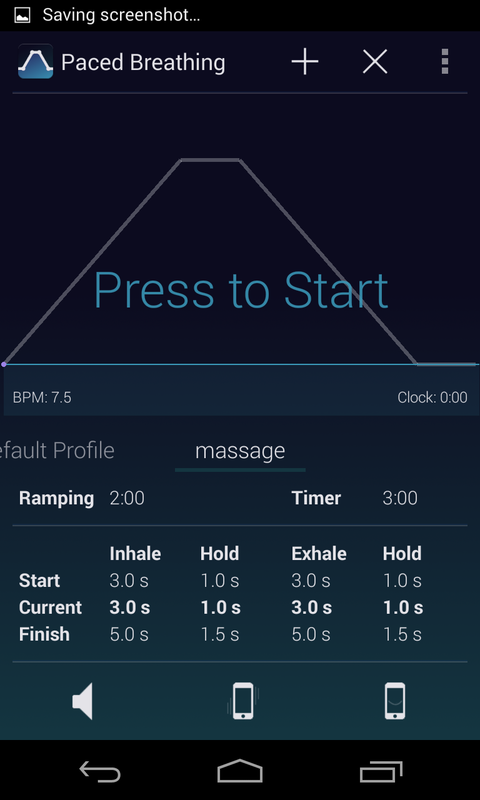 We recently heard from a user who told us she uses Paced Breathing when she gives massages. In this post we're going to cover how you can easily incorporate Paced Breathing into a massage to enhance relaxation for your massage partner. The concept is quite simple: your massage strokes go in rhythm with the breathing of your massage partner. First off, make sure you have a quiet and comfortable setting. It also helps if you have massage oils or lubricants. We're going to teach you about the most basic massage stroke called the effleurage. Effleurage is a French word meaning "to skim" or "to touch lightly on". This stroke is used heavily at the beginning and end of a massage because it helps keep the entire back warm and helps the masseuse spread massage oils over the back. If you are standing, to perform a basic effleurage start from the top of the back, near the shoulders, and stroke down with both hands until you get to the small of the back. If you are on top of your partner, start from the small of the back and stroke up to their shoulders. Once you finish the stroke, slide your hands back to your starting position down the sides of the back and repeat. Start gently and apply more pressure with each stroke, but be sure not to over do it. Here is a short youtube tutorial showing you how to perform this technique. To incorporate Paced Breathing, tell your massage partner to inhale when your hands are sliding down the sides of their back, and exhale when your hands are effleuraging over their back. 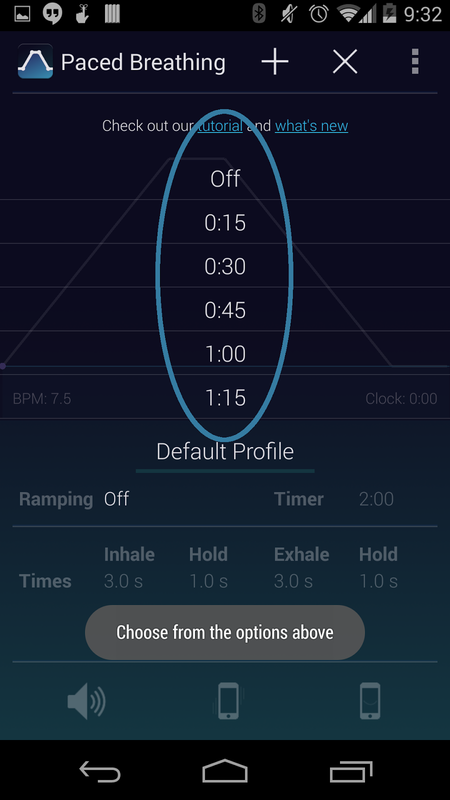 We've set Paced Breathing to a 3:00 minute timer, 2:00 minute ramp, starting from 3-1-3-1 (inhale-hold-exhale-hold), and ending at 5-1.5-5-1.5, but you should experiment to see what works best for you and your partner. Make sure the sound and vibration features are off to avoid creating distractions; just watch the screen to time your massage strokes. This same concept can be used with other massage strokes to greatly enhance a massage. You can find more tutorials (with video) on a variety of massage strokes here. 2. AFTER joining the group, visit this link to opt-in! That's it! You should get an app update shortly if there is a beta available. We'll be sure to send out an email to the beta testers Google group to give you guys a heads up when we're pushing a new beta (don't worry it won't be too often). And if you ever change your mind and don't want to be a beta tester any more you can just use the same link from step 2 to opt-out. 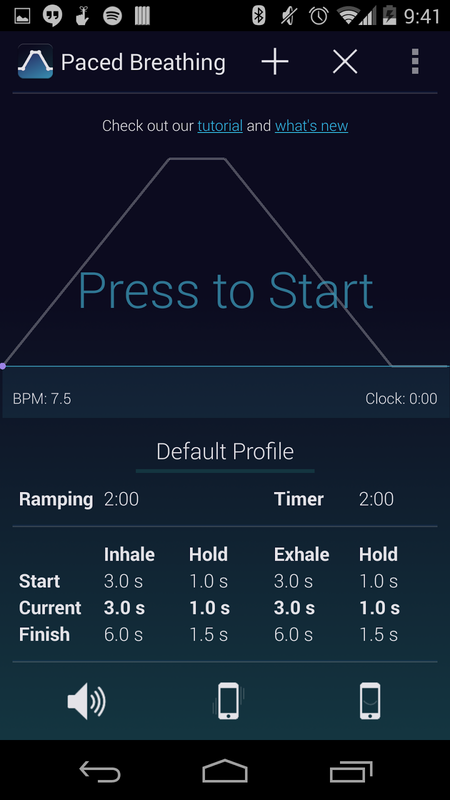 With our update in late January we introduced a binaural beats option. Many people believe that different binaural beats are able to stimulate our brainwaves to mimicking those same frequencies and therefore move us more towards that state of mind. For example, listening to a beta binaural beat may make you want to be more active. How do I use them in Paced Breathing? 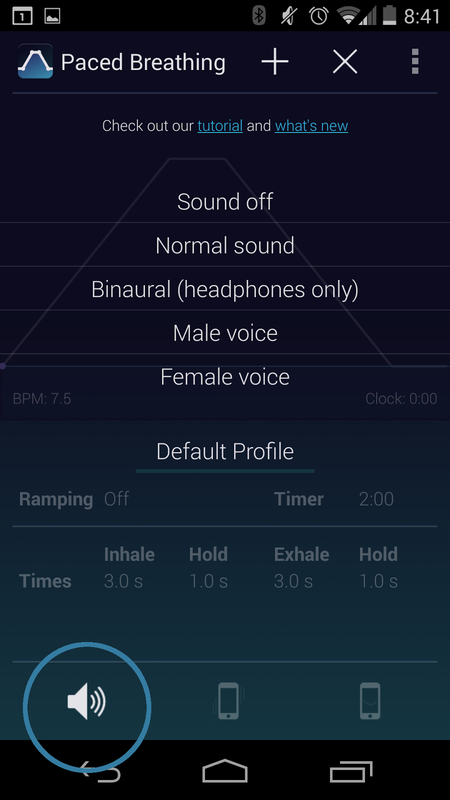 Plug in a pair of good headphones into your phone and turn on binaural beats in Paced Breathing by clicking on the sound menu (Figure 1) and selecting Binaural from the menu. Make sure the volume is set low; the sounds aren't any more effective the louder they are, so there is no sense in straining your ears. We've actually found the beats quite soothing at low levels, but quite maddening when turned up too loud. Paced Breathing normally plays a combination of 196Hz (G3) and 392Hz (G4) sounds in mono when inhaling, and 261.63Hz (C4) and 523.25Hz (C3) sounds when exhaling. When you switch to binarual beats mode we play those frequencies in your left ear and in your right ear we play those same frequencies at a 4.5Hz higher frequency; meaning we play a binaural beat of 4.5Hz which is classified as a Theta wave. As of today, you can't. However, we will add the ability to change your binaural beat frequency in the future. 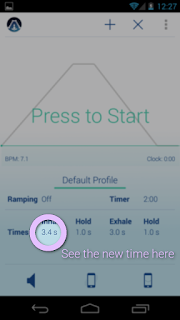 We've just updated Paced Breathing and with it came some new features, including profiles (if you don't have the latest version, be sure to check it out)! 1. 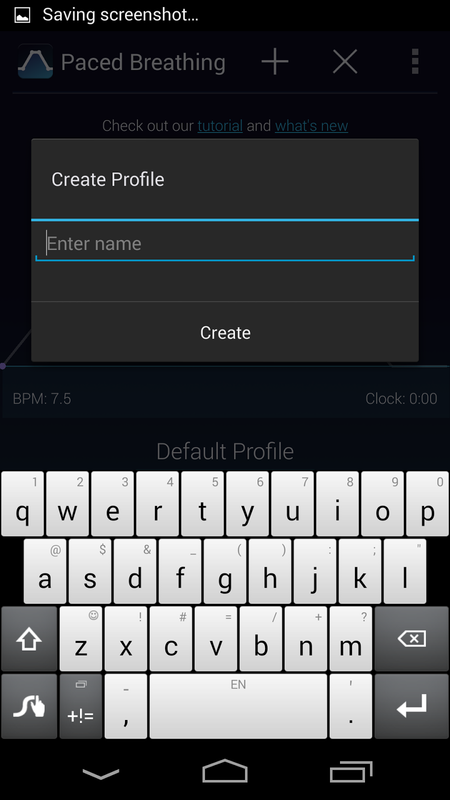 Press the + icon in the top right (See above), if you see no + icon, press the menu button and select "Create Profile"
2. Enter your desired profile name (e.g "yoga") and hit "Create"
All settings save automatically, so you don't need to worry about saving. To switch profiles, simply swipe left or right on the bottom half of the screen to flip through your profiles. If you like profiles, you can upgrade (from the menu) to be able to create an unlimited number of profiles! 1. Press "OFF", next to "Ramp"
5. Hit start to start your session! The "Current" row is just there to show your breathing times during your session. During your session you'll see this row and the graph change, from what's in your "Start" row to what's in your "Finish" row. After your ramping is done (in our example it's 2 minutes), your session will continue with the times you set in your "Finish" row. Tip: if you want your session to stop automatically use the "Timer" option, to the right of ramp (try setting it to 5:00 for 5 minutes, and use it with ramp)!